A heavy duty screen that gives protection from rocks, gravel and road debris, deflecting it down and away from the vehicles headlights, windshield, and vehicles finish. 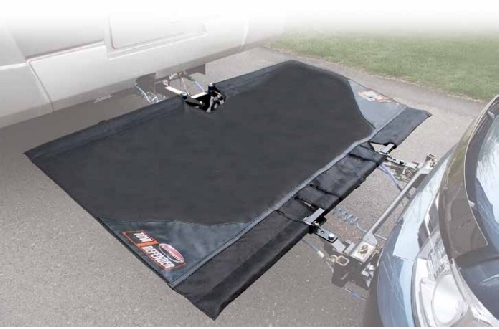 Offers 20 square feet of protection, easily rolls up and stores against the Rv. Use an exhaust "turn down" to redirect the engine exhaust, if located directly below the Tow Defender. The Tow Defender fabric may be warped or otherwise damaged if a turn down is not installed, or if other exhausts which cannot be redirected are in close proximity to the fabric.